Young adults are spending money they don’t have. Millennials, those younger than 35, are the only age group with a negative savings rate, which has dropped to negative 2 percent, according to a recent CNNMoney story. Here’s the good news. With a little bit of help and some hard work, millennials can work their way out of the red and start laying the groundwork for a brighter financial future. Establish a game plan. “It’s hard to get to the finish line if you don’t know which direction to run,” Houy said. Now that you’ve identified your goals, start saving for them. In the beginning, set small, realistic goals. 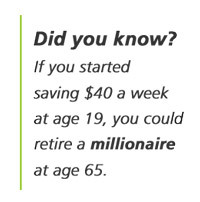 Maybe you start saving $50 a month or $10 a paycheck. Right now, it’s more about establishing sustainable money habits that will move you in the right direction. Attack debt as a form of future savings. Another way to approach savings: Aggressively attack the debt you have. If you have student loans or credit card debt, making minimum payments will bleed your budget, Houy said. Start paying a little extra each month to reduce your debt faster and move toward savings and financial freedom.